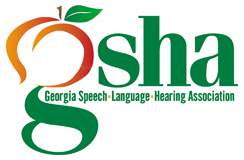 The Georgia Speech-Language-Hearing Association (GSHA) is a professional association of individuals specializing in the prevention, diagnosis, and treatment of human communication disorders that advocates for the professional interest of its members and the individuals they serve, and provides a forum for the exchange of professional information and ideas. Contact our Headquarters office at (407) 774-7880 for immediate assistance or click here to email us if you have any questions relating to your membership. Reduced fees for GSHA-sponsored and co-sponsored continuing education workshops. Opportunity to earn Continuing Education Units (CEU's) and Professional Learning Units (PLU's) at conventions and continuing education workshops. GSHA is actively monitoring legislative issues and activities that directly affect the practice of audiology and speech-language pathology in all settings with local, state, and national agencies and organizations. Legislative updates are available at Legislative Updates. To monitor and assist the Association's legislative activities, in addition to continuous monitoring of activities that directly affect the practice of audiology and speech-language pathology with local, state, and national agencies and organizations. Stay up to date with the latest information on tri-alliance meetings. Public Information Activities and Promotion of "Better Speech and Hearing Month"
Public awareness of the Speech and Hearing professions, including a proclamation by Gov. Nathan Deal recognizing May as Better Hearing and Speech Month in Georgia. The Georgia Speech-Language-Hearing Association maintains a list of positions available in the professional community. Receive reduced rates for job postings on the GSHA website. Inclusion in GSHA's annual directory of members, facilities, and resource services in Georgia. Members can join us for networking and an open discussion of current issues in the profession on the GSHA Listserv. Resources and information related to professional licensing and certification. Get Recognized! GSHA Annual Honors and Awards Nominations Opening soon. The Honors and Awards Board will be accepting award nominations later this summer to be presented at 2019 GSHA Convention. Any questions regarding the awards and honors can be directed to the GSHA office at [email protected]. Each year, members of GSHA have the opportunity to nominate individuals for awards. Procedures for Nominations: Nominations may be made by any GSHA member. All nominees must be current members of GSHA and meet the criteria for the award for which the nomination is being made. A letter of support written by the member making the nomination, indicating in detail how the nominee meets the criteria for selection must be submitted electronically to Past-President, Chair of the Honors and Awards Board. Additional letters of support may also be submitted. The Governor of the State of Georgia Nathan Deal has proclaimed May as Better Hearing and Speech and Speech Month. The proclamation will be held in the ceremonial office with an official photograph with the Governor. Stay tuned for more details to follow soon! Host a GSHA social in your local area to network with colleagues, connect with friends and to enjoy the benefits of membership in May and beyond. Members and nonmembers are welcome. You provide the details and GSHA will do the rest. Hosting a social is easy and fun! For more information about hosting a local social contact Lauren Reinkemeyer, Public Relations Committee, Chair at [email protected]. “Children who can’t read proficiently by the end of third grade are more likely to experience poor health, have discipline problems, become teen parents, and drop out of high school. As adults, they’re more likely to spend time in prison, struggle with unemployment, and face shorter life expectancies”. Get informed, access resources and learn how to support Georgia’s data driven campaign to boost literacy and learning outcomes for all Georgians. Be a part of the common agenda to get every child in Georgia to be on a path to reading proficiently by the end of third grade in 2020.